Was talking to an acquaintance yesterday about college and about how this person feels nostalgic for college. They’re happy enough now, but they also feel constrained. I joked that nostalgia for college was “the dark side.” Which was a bit facetious. I’m still astonished by how idyllic the setup for college (at least in the upper-middle-classes) tends to be. It’s all the privileges of adulthood and none of the responsibilities. You can do whatever you want, whenever you want. I mean, we pay lip service to the idea that you’re there to learn, but if you want to, it’s very possible to get through college with minimal effort. However, I, personally, do not feel at all nostalgic for college. In fact, when I walked aroiund the old alma mater yesterday, I actually felt a vague sense of dread. It wasn’t overwhelming. I was still able to feel nostalgic. It was nice to reconnect with myself at a younger age, just because I usually feel so disconnected from my past self. I enjoy that sense of continuity. As in, yes, I am the person who once ate hot cookies (and ice cream? Or am I just imagining the ice cream?) every day in the Wilbur dining hall. But the sense of dread was real. And I was profoundly glad, during my whole walking tour, that I was not in college anymore. Now that I’ve been out for six years, I feel like I can say that my four years in college were unquestionably the darkest time in my life. I had plenty of fun. I made lots of really good friends. I saw and did lots of new things. But I was also acutely miserable much of the time. It’s no one’s fault. Not even my own. I don’t really know what caused it. I don’t think drinking was entirely the cause of the misery (though it didn’t help). I think I just wasn’t equipped to live in such close quarters with so many people. I remember I just felt really awkward, really shy, and really emotionally stunted. I felt like everyone was making lifelong friends and falling in love, and I was in stasis. I had no idea how to relate to people. No idea how to talk to them. Couldn’t understand how to make friends. And the only way I could face people was by drinking. But the drinking then led to more negative feelings and more fragmentation and confusion. And I really lost my sense of self. In high school, I was relatively happy (most of the time). And I had my friends and my place in the world. I was elected Student Council President, and I was not unpopular. I kind of knew who I was. 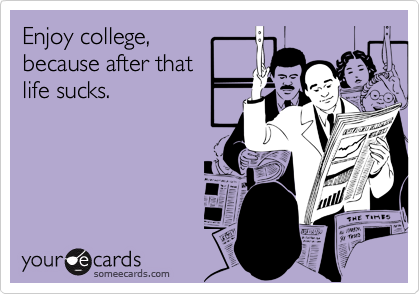 But in college, I felt completely helpless. I wanted desperately to feel close to people, but I just didn’t have the first idea how to go about it. All I knew how to do was go to parties and drink. But even there, I felt so shy. I’d walk around in circles in the hopes that the constant movement would obscure the fact that I was there alone. I’d stand silently at the edge of peoples’ conversations until I was finally drunk enough to break in. It’s still amazing to me. Nowadays I am so systematic in how I handle my problems. But back then I didn’t even know that being systematic was a thing. I didn’t even know that I had a problem which I could work on and get better at. I think I was stunned by the environment. The crush of people was so constant and all-encompassing. There was no room to reflect, and no way to take stock. I’m struggling to articulate what I mean when I say that my sense of self was gone, because it’s a complicated and subtle thing, a sense of self. I guess what I mean is that everything was so immediate. I couldn’t even think about next week. I was in triage mode all the time, because each day and each moment brought such powerful waves of loneliness and anger. Part of me is wondering if I’m being overdramatic. But I don’t think so. It really was that bad. And I really did regress and become less capable of interacting with people and making plans for the future. In contrast, every year since graduating has been great. Even my first year out, when I was jobless and still drinking, was much better than the year prior. And although I’ve had periods of depression in the time since college, I’ve always experienced that depression as something strange, something outside my normal mood, and something that I needed to work to address. I feel like in the last five years I’ve done all the things I didn’t do in college: I’ve learned to make friends and to relate to new people, experienced romantic entanglements; found my vocation; and learned lots of new things. It’s been great. You couldn’t pay me to go back.